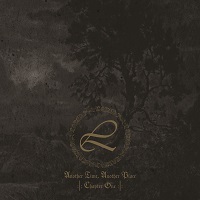 Since the formation of this solo project over a decade ago, the Swedish Atmospheric/Ambient Black Metal mastermind behind LUSTRE, Nachtzeit, was never one to rest on his laurels, releasing a steady stream of music over the years. Despite the project being currently “on hold”, this has not stopped LUSTRE from releasing even more material. The end of this month sees the release of the first chapter of a two-part compilation entitled “Another Time, Another Place”, which tells the tale of the changing of seasons from autumn to winter. This compilation sees music which has never before been released, as well as music from the “Welcome Winter” EP from 2009. A velveteen atmosphere enshrouds you from the very first notes of “The Ardour of Autumn (Part 1)”, reminiscent of the captivating introduction used by ELDAMAR on their “The Force of the Ancient Land” album. As with much of such ambient music, the keyboards remain in the fore, with the harsher Black Metal lurking in the depths underneath. Each of the four songs spans about ten minutes, leaving plenty of room to weave epic soundscapes into the tapestry of the songs. “The Ardour of Autumn (Part 2)” takes on a much more melancholic feel, with the start of the song having the stately progression of a funeral procession. Even when the harsher sound kicks in, it does little to relieve the tristesse, but rather lends a rawer feel to the melancholy. Yet despite this pervasive sadness, there still seems to be a glimmer of hope that arises in the second half of the song. “Welcome Winter (Part 1)” on the other hand comes in with a soft enchanting flurry of glittering notes that swirl gently down, sounding like the magical first snowfall of winter. In comparison to this “Welcome Winter (Part 2)” is a much more mature melody, redolent with the grace, elegance, and pristine beauty. Here the gravely vocals seem to perform an intricate courtship with the ethereal key melody, never quite capturing the tune yet moving in perfect synchrony. To be blunt, there is nothing really outstanding about this album. Everything from style to song structure to sound has all been done before. But this is not meant as a criticism of the album. In my opinion, more ambient and atmospheric music should not necessarily be measured by its innovativeness, but rather by how much the music mesmerises you and draws you under its spell. And “Another Time, Another Place (Chapter 1)” certainly does this, with the album seeming to fly by, despite having a run-time of almost three-quarters of an hour. With all this having been said, “Another Time, Another Place (Chapter 1)” is definitely worth checking out if you’re into bands like SUMMONING or the previously mentioned ELDAMAR. And if you’re already a fan of LUSTRE’s, then you can look forward to some captivating music stemming from their earlier days and style.